It‘s been more than 70 years since the Second World War ended. However, traces of the biggest humanity‘s conflict can still be discovered. Just recently a Bell P-39 Airacobra fighter has been retrieved from the Lake Shukozero in Russia and a year ago a couple of Sherman tanks have been recovered from the bottom of the sea almost in the same place. Bell P-39 Airacobra is a peculiar airplane. It took off for its amiden flight back in 1938 and entered service in 1941. It featured one unusual construction solution – its engine was mounted behind the pilot, which meant that a long shaft was required to spin a traction propeller. 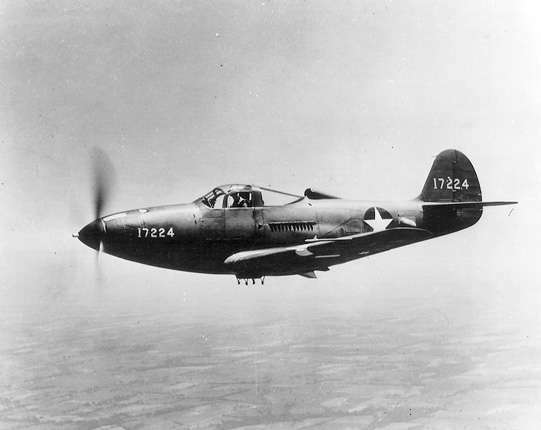 However, it was a good fighter plane – it is often said that together with P-63 Kingcobra, the P-39 was one of the most successful fixed-wing aircraft manufactured by Bell. But it did have one issue – its engine was not turbocharged or supercharged. It meant that it could not operate at high altitude very well and therefore RAF did not want it. Meanwhile soviets took it gladly – 4,746 P-39s Airacobras were sent to Soviet Union to aid its efforts of fighting Nazi Germany. However, this one did not fall into a lake because of some intensive fighting – this accident occurred on a training mission. As it was said, Fyodor Varavik lost control of his airplane and crashed into Shukozero Lake in northern Russia. Since it was March of 1945, lake was covered with ice so it could’ve been that Varavik performed emergency landing, but at the result is clear – P-39 Airacobra sunk to the depth of 45 metres. Recently this plane has been discovered and Russian Navy personnel assigned to the Northern Fleet organized the recovery operation. Divers reached the plane, but no human remains were found – only a boot of the pilot was inside of the plane, together with 37 mm ammunition and oxygen tanks. Bell P-39 Airacobra was retrieved and now will find its way in a museum. Very likely, it will not be restored – it will remain authentic with its own story. 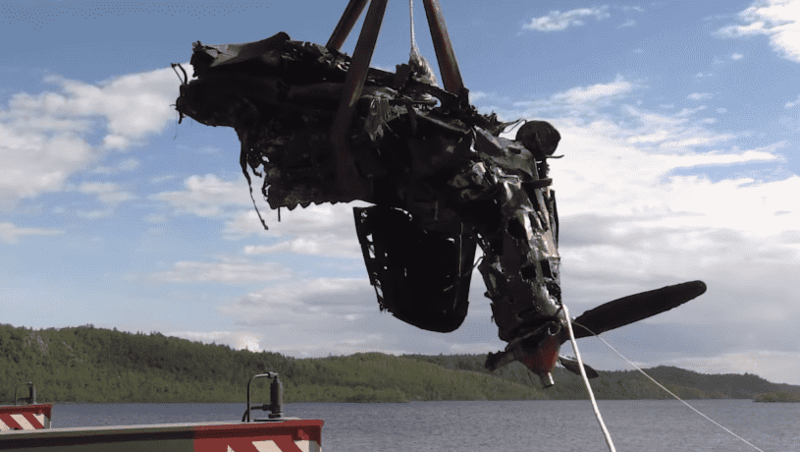 Plane was found in a lake in Murmansk region. Not too far away last year Russian Navy recovered a couple of American Sherman tanks. They went down with the SS Thomas Donaldson ship, when it was torpedoed by a German U-Boat. Tanks were also meant to help Soviet Union – in total 4,102 M4 Sherman medium tanks were sent to the Eastern Front. Interestingly, despite spending 71 years in salty water, tanks were in decently good condition. Some say it is because they were packed very good and could resist water damage for some time. People love stories about tanks and planes sunken to the bottom of the sea and later discovered by some enthusiasts. But the truth is that most of it is just some legends and myths that are completely made up or got distorted through the years of going from one person to another. However, it is very satisfying to see these gracious machines emerge from their watery grave, because some more years and nature will claim what is hers. Soon all of the lost WW2 weapons will simply be rotten away. Alternative history is a rather weird hobby. People analize events and decisions and try to guess how history would‘ve changed is some decisions were different. It is not really a productive thing to do, but many people enjoy alternative history and consider it to be a mental exercise. Therefore, we present you with a little piece of alternative history – 5 ways how Hitler could‘ve won the Second World War. It is important to note that none of these speculations are by any means serious history science. We are judging past events from our current perspective and we have so much more information than people who were making decisions back in a day. We see everything from a top of our book shelf, we know personalities from both sides of the front and we can now identify some decisions as mistakes – it certainly looked different 70 years ago. These theories are the most interesting ones we fished out from the internet. Many WW2 enthusiasts agree that attack on Soviet Union was one of the biggest Hitler’s mistakes. At least its timing. There is a theory, stating that invasion to British Islands might have been a smarter decision. 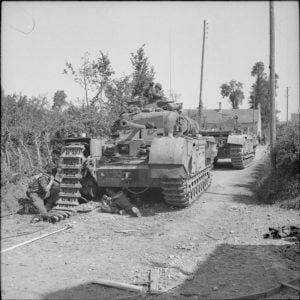 After France fell, a lot of British heavy armour was left behind and thus forces of this country were weakened. A well-planned an organized invasion could’ve removed one potent enemy from Hilter’s path to ultimate victory. Of course, there are holes in this theory. Royal Air Forces were already pretty strong and defeating them would not be so easy. Furthermore, Germany would’ve had to consolidate its forces. That little bit of time could’ve been enough for Britain to prepare for possible invasion and to discuss situation with its allies. Also, it is not clear whether this decision would’ve helped avoiding fighting on two fronts – what would Soviet Union do later in war? This is one of the more interesting theories. Hitler was always seen as a cold-hearted tyrant, who partakes in ethnic cleansing as a maniac he was. But what if he wasn’t this way? What if he did not hold strong policy against Jewish people? Some speculate that in this way Allies would’ve had a harder time mobilizing themselves for a fight against Hitler. Furthermore, a lot of resources, both material and human, were simply wasted in this bloody campaign. 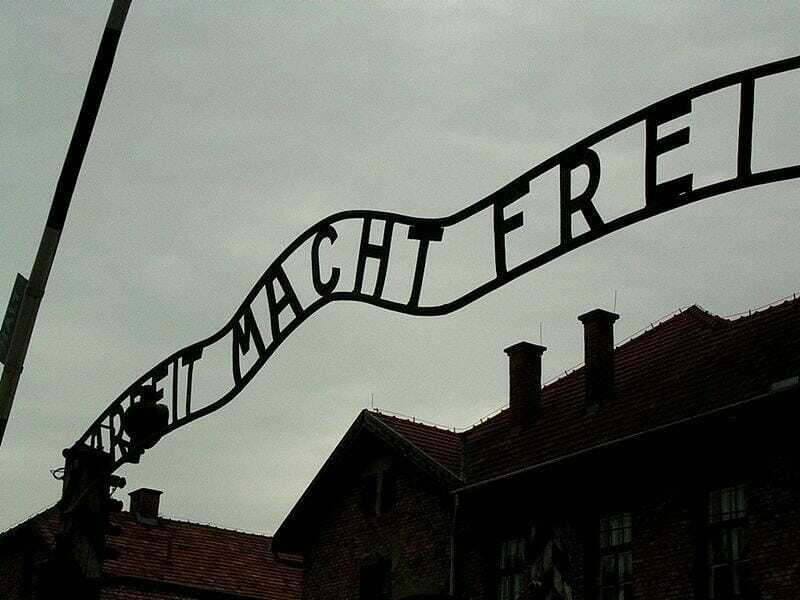 And some public support was lost because of Holocaust, not excluding people directly affected and murdered. On the other hand, this basically means that Hitler would’ve been a different person all together and would have surrounded himself with different people too. So in a way, no one can tell how it would have changed the course of history, if Hitler himself did not hold anything against Jewish. Dominating world’s oceans is a huge asset to have. 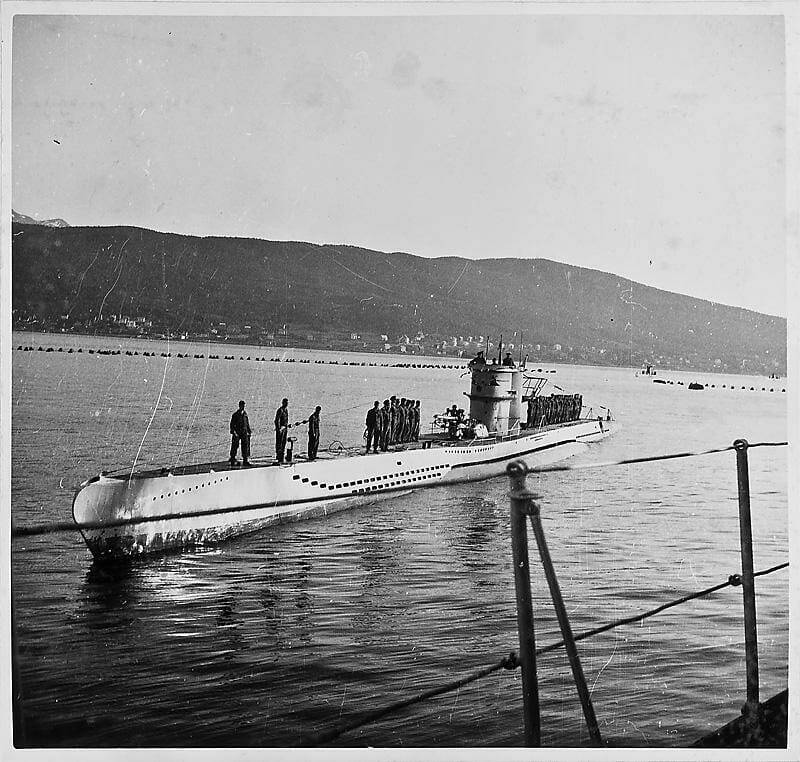 However, Germany could not enjoy any kind of dominance (maybe under water), since its navy was not fully developed. Having a stronger fleet of surface ships could have led to stronger pressure against Allied forces were they least expect. Furthermore, it could have allowed a closer coordination of actions with Japan. In essence, strong germane navy with alliance with Japanese forces could’ve dominated world’s oceans and seas, but there is one condition. This means that war would have to be started later. In fact, at least a decade later – around 1949 seems like a reasonable time. And at this point in history everything would’ve been different. In 1940 when France fell Germany was pushing hard on somewhere around 350 thousand Allied soldiers, most of whom were British. German tanks were fast in their way to encircle their enemy while Luftwaffe was smashing them from above. 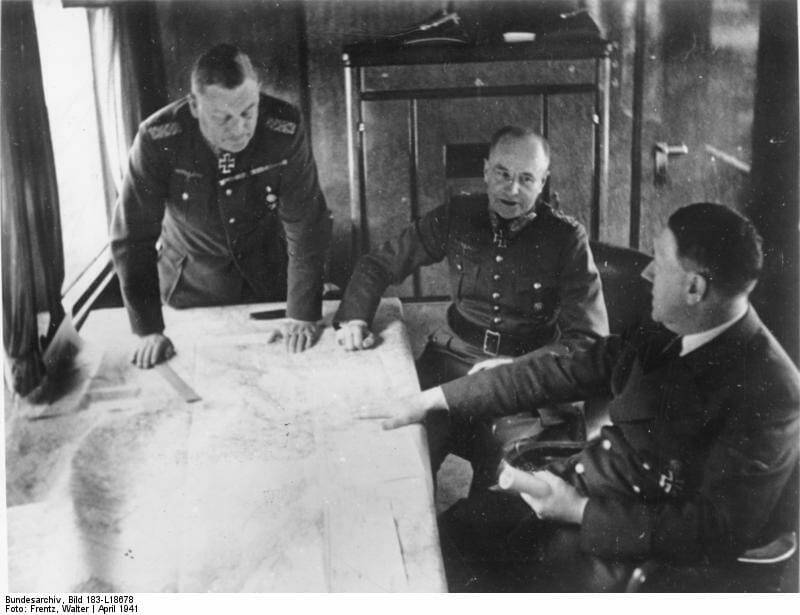 However, on 24th of May Hitler ordered to halt the operation for three days. It is believe that this decision was influenced by Field marshals Gerd von Rundstedt and Günther von Kluge – they did not want unconsolidated German forces to encircle Allied soldiers, because they thought they would easily break out. 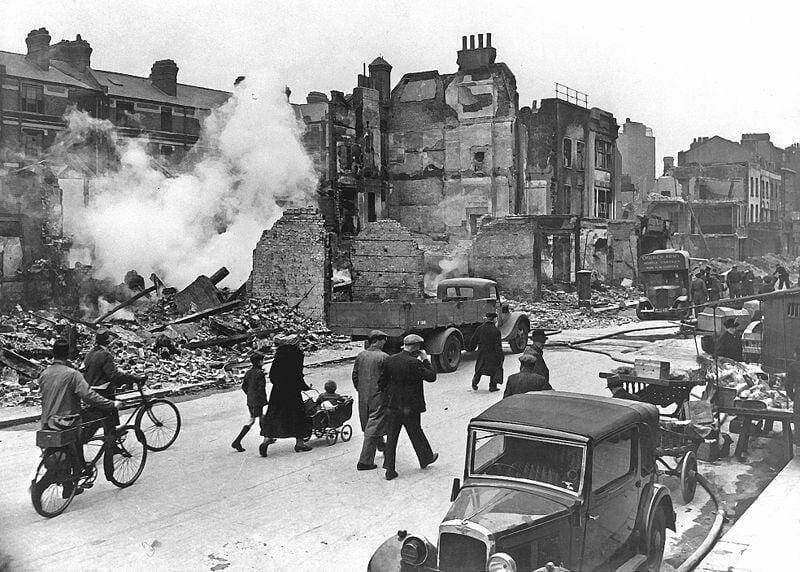 This gave time for Allied forces to establish defence lines and evacuate relatively safely. A lot of heavy weaponry was left behind as well as 68,111 British soldiers were killed, wounded or captured. But most of them left France relatively unharmed. 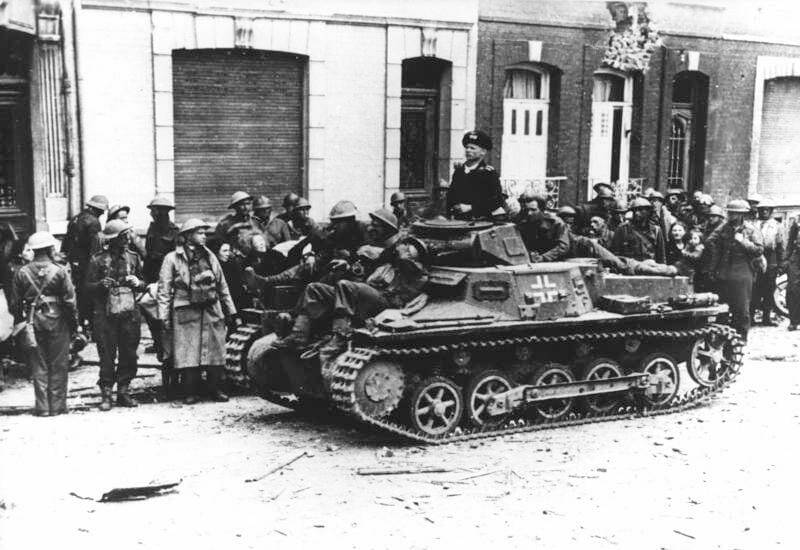 Great Britain already considered conditional surrender at the moment when Germany halted its advance. Many believe that Hitler missed a chance to eliminate Great Britain from war with one easy blow and who knows now how it would’ve changed the course of the war. It is a well-known fact that Hitler enjoyed being in charge of all military operations of Germany. Not only he was aware of the situation in places thousands of kilometres away, he was commanding operations by himself, sometimes removing his generals from the equation. However, this did not mean he was a flawless leader. In fact, Hitler had experienced and well-educated military personnel, which he did not take full advantage of. He got mad if someone opposed his opinion and sometimes gave irrational orders, especially as war was coming to an end. Had he listened to his generals and involved them more in strategic planning, some moves in was might have been different and some mistakes could have been avoided. Alternative history is really not accurate and goes against the principle of historicism. However, it can be a fun thing to do, allowing yourself to immerse your brain into something that is as much fiction as it is history. Many people get interested in military history because they like the weapons they see on movies or in museums. However, usually you can see these marvelous machines from the outside only and can merely imagine how the interior looks like. Several days ago we introduced the most beautiful steering wheels in the world, so we decided to follow a weird path and show you some driver positions of famous tanks of the Second World War. If you didn’t see our collection of the most beautiful steering wheels in the world, we invite you to check it out. But now let’s see where drivers were sitting in famous WW2 tanks. Panzerkampfwagen V Panther – one of the most well-known German tanks of the WW2. It was a bit newer and more modern than Tiger I, but smaller and lighter and, therefore, was considered to be a medium tank. It was quicker, had a slanted armour and was still prettty good off-road. While experts still consider Tiger I to be a more effective tank, it was double the price of a Panther. The Panther also had a simpler steering system – the usual manual levers. It was mechanical and reliable. The problem was that there was not much space for the driver, which was usual for the time, and pedals were extremely close together. Also, visibility was an issue (again, like in most tanks from WW2), especially when in 1944, its Ausf.G variant faced the removal of the driver’s visibility slot. Then the driver used only the periscope. Mk IV Churchill – British heavy infantry tank, used in 1941-1952. It was heavy and somewhat old-school looking for its time, which is why nowadays many war enthusiasts don’t really like it. People think it was too heavy, too slow and too clumsy when compared to other tanks of the same period. However, while Churchill could go at a max speed of only 24 km/h, it had some redeeming features. It could, for example, turn around on its axes with both tracks rotating at different directions. And while its tall tracks made it look like a WW1 machine and impaired the driver’s visibility, they also provided protection for the infantry – something that a tank was designed to do. And it was pretty good off-road too, allowing for some different modifications to use this extremely stable platform. T-34 is a legendary Soviet medium tank. It does not receive such criticism as the Churchill tank, because it was dependable, modern for its time and was respected by the enemy. 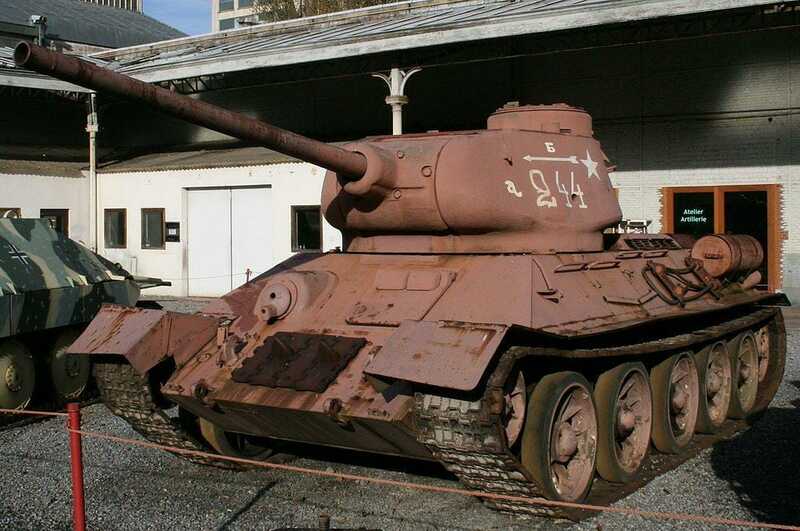 In the picture you see an unrestored example of T-34, so it is all quite messy and some instruments are missing. However, you can see the main driver’s arrangement in the tank. The driver was using the three usual pedals (clutch, brake and accelerator) and two levers. Levers are actually how most vehicles with tracks used to be driven – some still are. During the war, the U.S. did get a few examples of T-34 and noticed that some components were poorly machined and the transmission’s technology was already outdated. 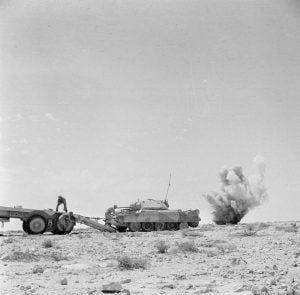 This, together with steel clutches, meant that the tank was pretty harsh on the driver. 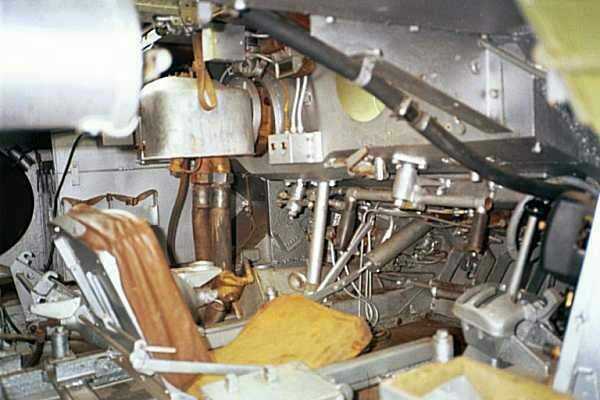 However, some other sources state that it was not too difficult to shift gears or operate the levers so it was not too bad. Although the soviet and Russian lack of attention to ergonomics is well-known until today. 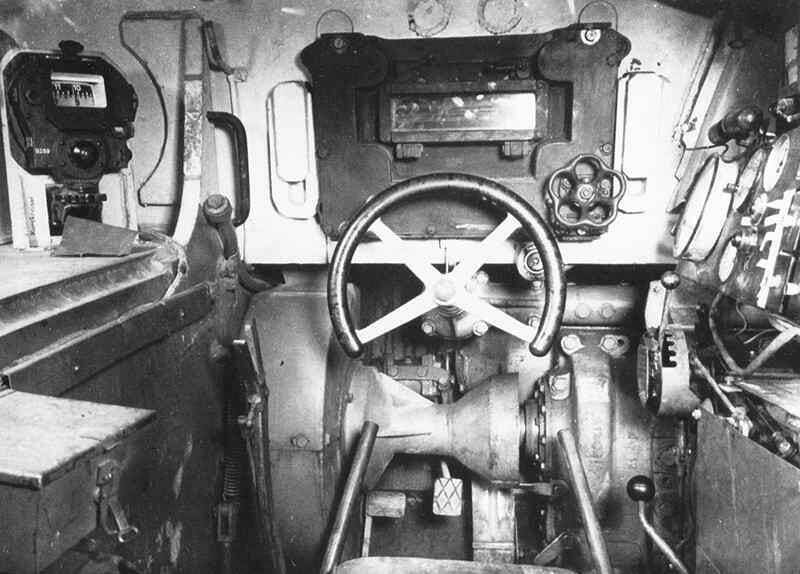 Driver’s seat of Panzerkampfwagen VI Tiger. Panzerkampfwagen VI Tiger probably has the biggest crowd of fans between WW2 enthusiasts. 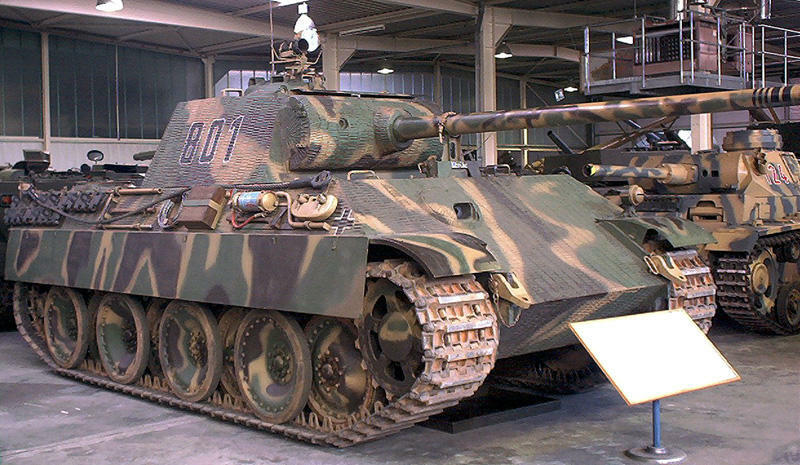 It was a German heavy tank, featuring design, which later evolved to modern day tanks. It was heavy, yet quick, large, but maneuvrable. And was decently good off-road. 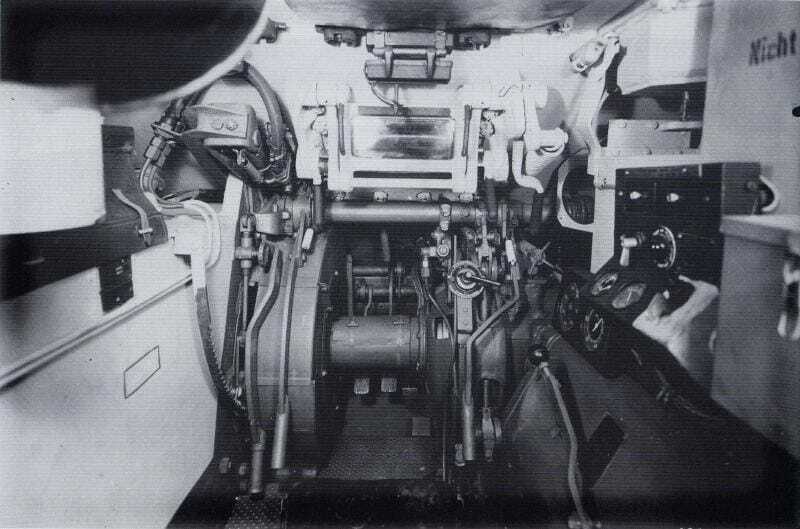 One of the unique features of the Tiger I tank was its steering wheel – something unseen in other tanks. People say that it actually made driving easier and pretty much ahead of its time. It had power steering too. In case this mechanism failed, the tank could be steered using a couple of levers on both sides of the driver’s seat. 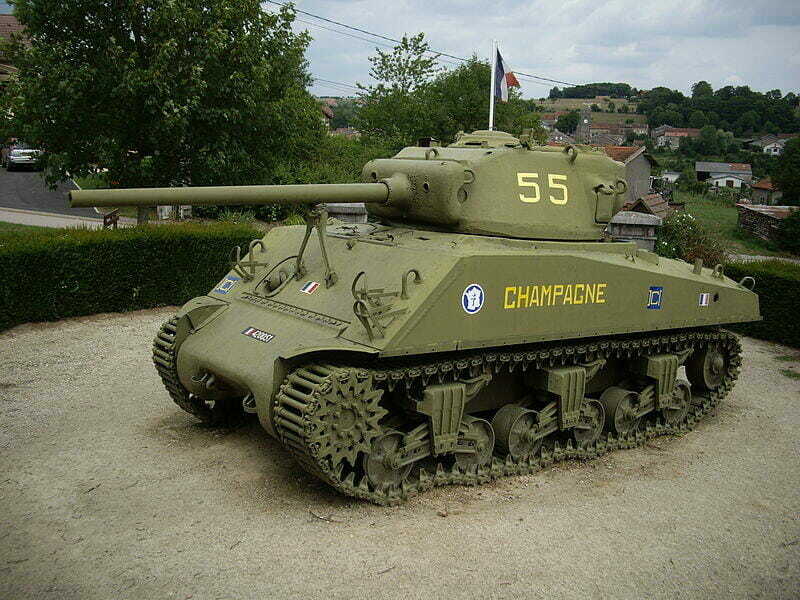 M4 Sherman – the most recognizable U.S. medium tank from WW2. It entered service in 1942, but it was still in use up until 1957. In fact, for a long time it was a weapon of choice, despite the more modern, better armed and armoured M26. 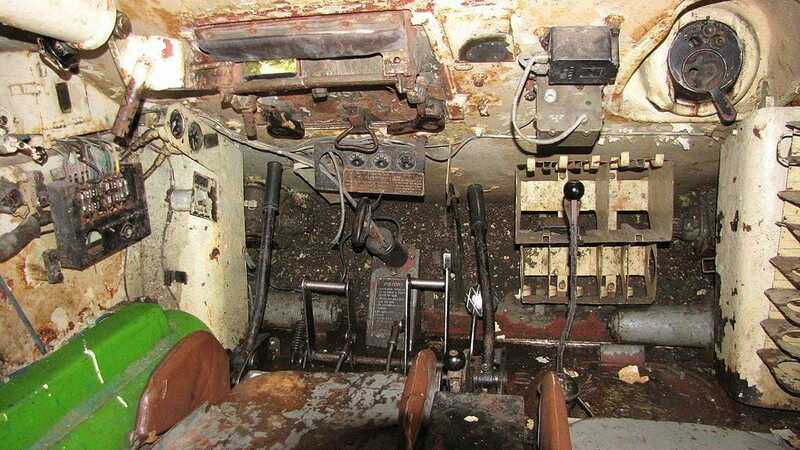 The steering of a Sherman tank was not really special in any way. Except, maybe, that both levers were very close together. In the picture you can see the driver’s seat in a Sherman tank, but the backrest is missing. While no one is really comfortable in a tank, Sherman’s drivers had little to complain, as there was more space for them than in some other tanks. Of course, this list could be expanded with pictures from other tanks. But we hope it was enough to get you interested in the history of tanks or WW2 in general. 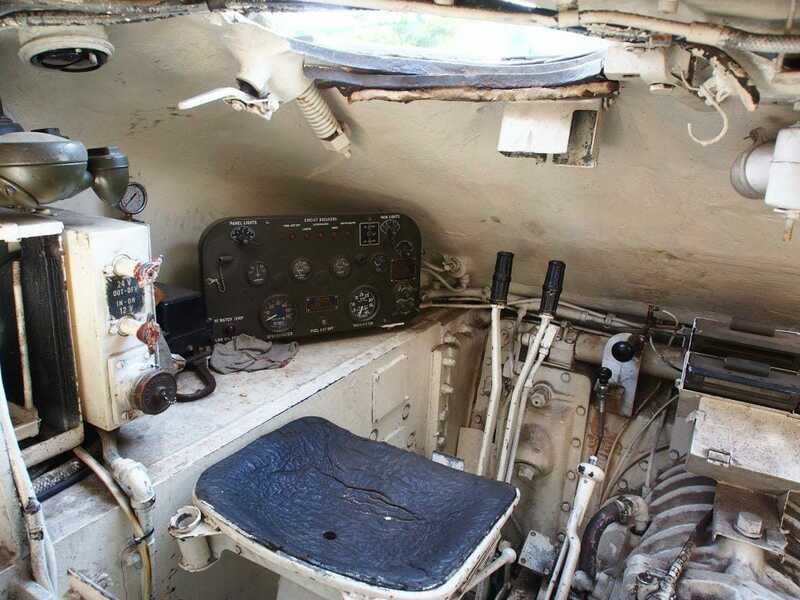 Posted in Technology and ScienceTagged popular history, Secod World War, tanksLeave a Comment on Driving a tank in WW2 – check out where drivers were sitting in the most famous tanks! Tanks are probably the most interesting piece of military machinery. In fact, in the language of common people tank is not a universal word for any other military vehicle with a large barrel. Obviously, in a war situation enemy tanks are intimidating and soldiers have to know proper techniques of defeating them. Here are a couple of instructional videos from the Second World War, teaching how to deal with enemy’s tanks. Instructional films are a very interesting piece of military history. While it is intriguing reading manuals, old training videos are so easily available – YouTube is packed with them. People unfamiliar with this type of video may get surprised about how well they are made – they almost look like pieces from an actual movie. However, they do have some important things to say, so here, take a look at this instructional video, which was used to teach US infantry how to defeat German tanks. As you can see, the narrator is having a beer during the filming of this video. And he is reading a script – he is basically an actor in this case. You may also notice the slang he is using – it is all increase relatability with the subject. So what did we learn? You have to wait for a tank to get closer and then open fire at it to make its crew “button up”. It reduces visibility, which can be pretty much eliminated altogether by shooting at vision slits and periscopes . Then, when tanks get very close, grenadiers have to start shooting rifle grenades. Finally, time comes for some Molotov cocktails. If you think this film was kind of artistic, you should see what German soldiers were shown during the war. This video is longer than the American one, but also much more movie-like. Take a look. This is just a good old action movie, except that it was meant to instruct the soldiers. Here you can see mines and other types of explosives being used. And the storyline is quite a bit more dramatic. WW2 instructional films are very interesting to see. Similar movies were made to just inform people about what is happening in the war zone. 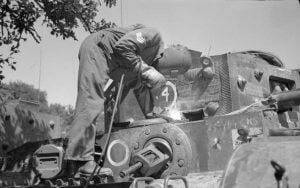 For example, how tanks are being repaired – a subject we covered in a previous article. Some people might not know, but the history of the Second World War has a rich community of enthusiasts on the internet. People love analysing battles, personalities and, of course, weapons. However, there is one area of the history of the Second World War that is rarely touched upon and does not have as many enthusiasts as others. Do you know how tanks were repaired on the field during the biggest conflict in humanity’s history? This article will not attempt to solve any mysteries of the WW2. It will not try to improve your knowledge about tank repair operations to an unprecedented level. Instead, it will briefly go through some interesting details of tank repairing that some people still get wrong. It is meant to invoke your interest and to show a peculiar side of military history that not many people think about. Tanks were extremely important in the Second World War. In some places, people still believe in legends and myths that damaged tanks were left behind. 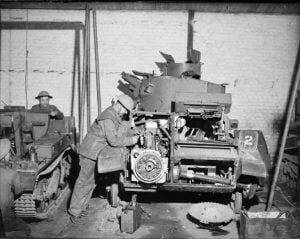 While that certainly happened in some cases, tanks were usually rescued and repaired. Not only they were expensive to make, they were extremely valuable in a battle and different units could not afford to wait for new machines to arrive. If repairs were not possible (if the tank was too badly damaged), machines were salvaged for spare parts, so that lightly-damaged tanks could be brought back to battle. Usually, the tanks were not heavily damaged at all, but were immobilized by broken tracks or minor powertrain problems. Abandoning such valuable vehicles was never an option. Therefore, special repair and rescue vehicles used to be sent into the battlefield to recover damaged tanks and other heavy machinery. Some of these vehicles were made using actual tank’s chassis, to give its crew more protection. They would pull immobilized tanks out of the military action zone so that they could be repaired in location or could be sent off to larger repair shops. In some cases, crews had to improvise. For example, when tracks get broken and lack some segments, they are shortened – as long as they cover the driving star, the tank will move. Not very fast and not very smoothly, but it is certainly enough to move to a new spot for further repairs. Sometimes working in field conditions required some unconventional methods and creativity. For example, when the British Churchill tanks were going through some field tests, crews struggled with gear selector levers – they were bending and breaking because of the light-duty metals used to make these rods. Mechanics quickly found a solution – semiaxles from Ford vehicles fit perfectly and were much stronger. In Algeria there were many damaged Churchill tanks, but around 60 % of them sustained damage to the turret only, and were perfectly drivable. Meanwhile, there were two other problems – a large number of damaged Sherman tanks and the shortage of 6 pound ammunition for British tanks. Percy Morrell decided to take the action into his own hands and try and fit Sherman 75 mm gun to damaged Churchills. It took some fettling around, since in American tanks the loader sits on the left and the gunner on the right, while in British tanks their position was inversed. This meant that the breach opened to the wrong side. Morrell solved the problem by simply rotating the gun 180 degrees. The “new” tank was so effective that there was an immediate order to start converting damaged Churchill tanks like this everywhere and around 200 of Churchill NA 75 were made in total. 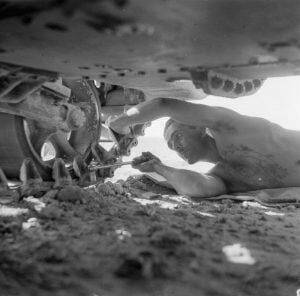 Tank repair was a task that required some hero characteristics from people. They had to be experienced mechanics, but also be able to work under pressure. A lot depended on these people, although now they are not as well known or researched as people who experienced war in front rows. 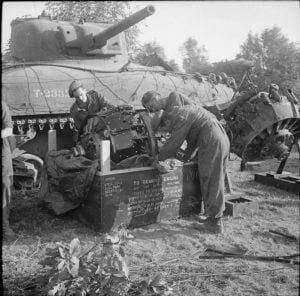 Hopefully, we will revisit this topic in the future, to try and find more interesting details about tank repair operations in the Second World War.